I wish you could drag into from the desktop or other apps. I wish that the app didn't block the UI when you click on the Gwibber tab when Gwibber isn't working. I wish the local files view had a watch on the current directory so that it refreshed automatically. I wish inking was smoother. I wish you could choose the size of the image that you are making. I wish that you could multi-select in it. But alas, if I wait until it has everything and no bugs, I'll never release. So, I am releasing Photobomb in my PPA. It is a free app. You can use it for free, and it's Free software. So, enjoy. However, I am *also* releasing it commercially into the software center. That means that you can choose to install from my PPA for free, or you can buy it from the Software Center. I guess the only real difference will be that I could break it in my PPA, and I won't generally plan to provide lots of support, but if you bought it, I'd feel a bit more like I should strive to fix your bugs and stuff. The code is GPL v3, so people can enhance it, or generally do whatever they think is useful for them (including giving it a way, or using it to make money). 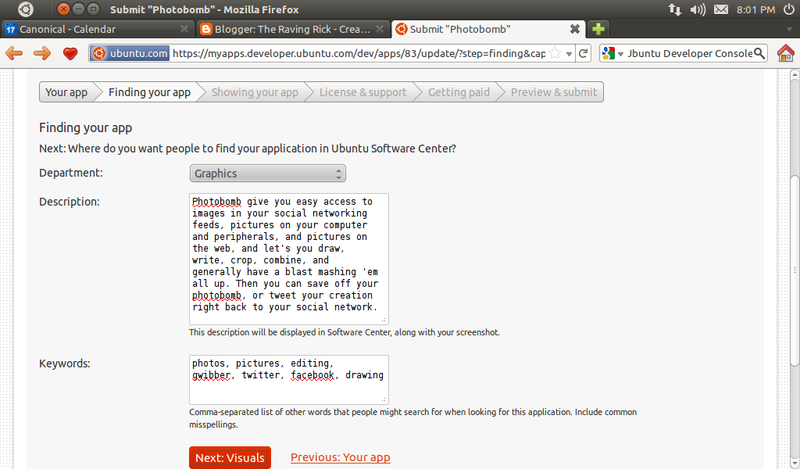 I found it remarkably easy to submit photobomb to the Software Center. 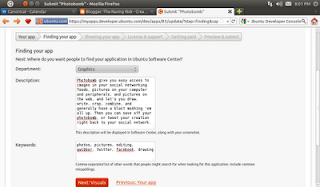 I just used the myapps.ubuntu portal, and it all went very smoothly. Really just a matter of filling in some forms. 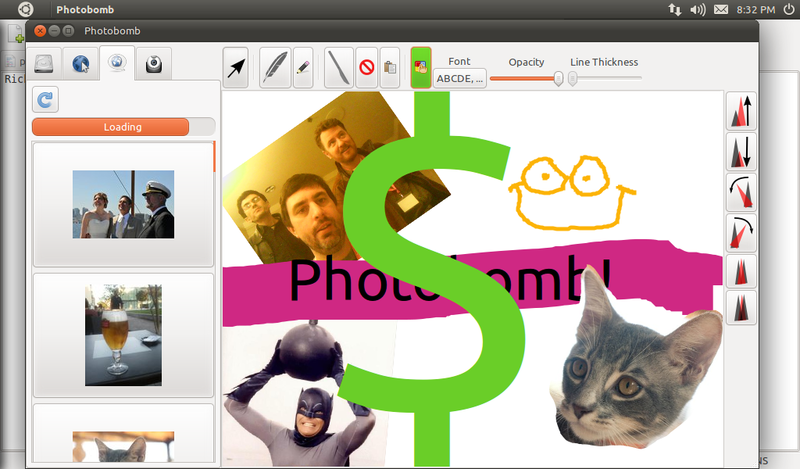 Of course, since I used Quickly to build Photobomb, Quickly took care of the packaging for me, so that simplified it loads. I'll keep everyone posted on how it goes! Why can't you drag in from the desktop? Does this require a hook into the wm ?